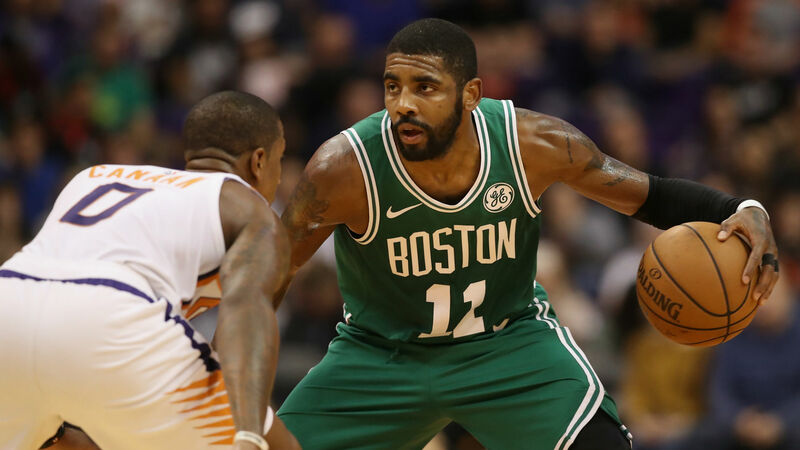 Kyrie Irving lauded the Boston Celtics' desire after leading the team to a sensational fightback and an overtime win at the Phoenix Suns. The Celtics were 20 points down on the road at halftime before surging back and eventually triumphing 116-109, with Irving scoring a season-high 39. The former Cleveland Cavaliers star acknowledged that tough spells are part and parcel of life in the NBA, but he was pleased with Boston's reaction. "It happens. On these road trips, you want to come out and play well," Irving told NBC. "Obviously, with us forming this team, our camaraderie, our cohesiveness, we've got to figure it out as a team. "We've got to be resilient, have heart, and I think we showed that desire to win. We wanted it." While Irving delivered in spectacular fashion with six points and two assists in the additional period, he deflected praise back onto his team-mates. "It was definitely kill time," he said. "I wanted to come out aggressive, make sure I made the right plays at both ends of the floor and play to my strengths, as well as trusting my team-mates. "I think that's the most important thing that we're starting to figure out: it's not about who scores, it's about the trust, making that extra pass, making a play and having confidence. "That's what it really comes down to and I feel like we did a great job figuring that out, being down 20 going to halftime. We made some strides, but we put ourselves in a hole and we don't want to do that."